Keep your pet warm, comfy, and cute in the in the Barking Basics!® Dog Hoodie in Black! Your search for the perfect pet hoodie is over! 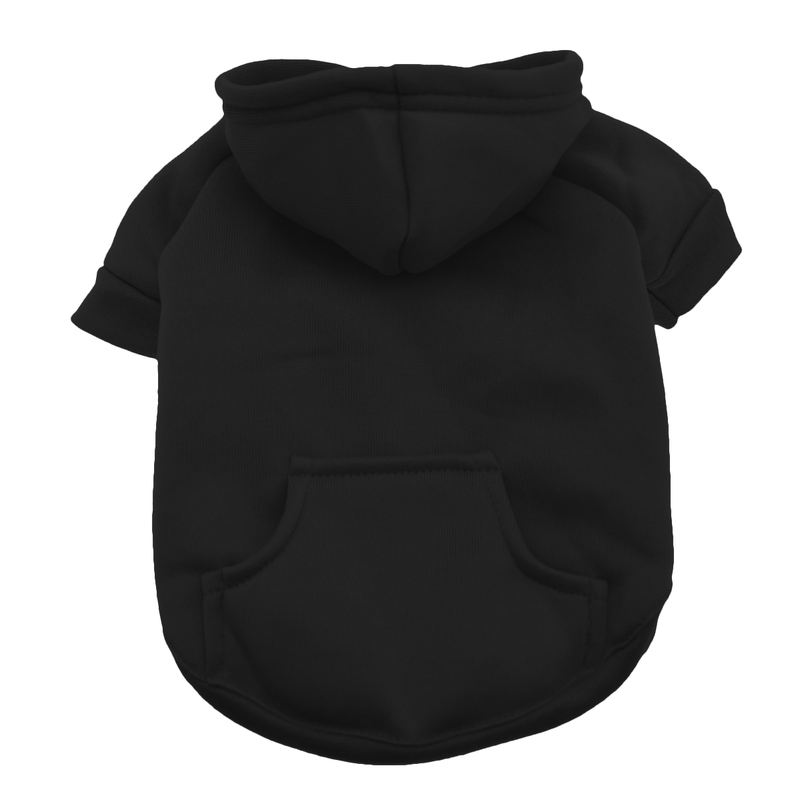 The Barking Basics!® Dog Hoodie in Black is sure to be your dog or cat's favorite wardrobe item to keep them looking good and staying toasty. Barking Basics Dog Hoodie - Black Customer Photos - Send us your photo! Cooper is such a good boy. He is so loyal to his pack. He is 5 now but still acts like a puppy. he loves to pose for the camera ?? Lady Teddy (corgi-dachshund) loves her cozy black hoodie, perfect for the casual cold-weather look! LOVE these hoodies! SOOOO soft and stylish! Great fit! Cinnamon is the best! She is a King Charles Cavalier/Cocker Spaniel mix & we saved eachother! Zuzu loves her black barking basics hoodie. We get it in a size small so she has some extra room. Zuzu is 3lbs. We call this her Mr. Robot hoodie. Luna just sporting her newest winter hoodie to keep her warm as she plays outside with her new baby sister Zuni as you can see with her little smile she’s kinda used to get her new clothes from Baxter Boo ?? This little dude loves his hoodies! Brooklyn is my sweet 2 year old Staffy and Willow is my sassy 14 week old Bully Pit. These two love staying warm in their hoodies. These hoodies are perfect for my fur babies in Michigan weather. Willow is my sweet 14 week old Bully Pit. She loves being all nice and snug in her hoodie. Daisy is my 9 year old Boxer baby. She loves staying toasty warm in her hoodie. Plus the hoodie makes her look so adorable! Brooklyn is my 2 year old Staffy. She is always so happy when I put her hoodie on her. These hoodies keep my sweet baby nice and warm in chilly Michigan. Willow is my Bully Pit rescue. She is 14 weeks old and loves her hoodie! It keeps her nice and toasty warm in chilly Michigan. Hanz all snuggled up in his little hoodie amongst the pillows on our bed! My little lady Noelle is rocking her Baxter Boo black hoodie. She's looking startled because she just got caught taking some treats. This pose reminded me of Beavis and Butthead! ?? Messi is chilling in his hoodie.......It's so toasty warm and soft! He's ready to go to doggy dreamland. Ziggy is a sweet little red brown mini poodle. He loves his hoodie! Greddy Tein is so excited for fall now that he has a new hoodie! It's a little snug in the chest but everywhere else fits perfectly. best fitting hoodie i've found for his precious pug build. Annie's not too happy about posing in a hoodie when it's 90' outside!! Good thing we're doing this inside!!! But she can't help thinking how fun it will be when it gets cool and she'll be all set to go chase the ball outside in her awesome Barking Basics black hoodie!!! She's wearing a medium which gives her plenty of room for comfort and her harness if we decide to go for a walk!! I swear his the cutest thing ever playful, lovable, pure happiness the hoodies are so cute can't waif for the fall/winter because we are more than ready for the cold. 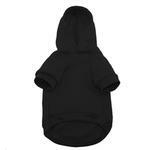 I purchased 3 hoodies in small the fit is perfect and material as well my baby is yorkie/bichon 7lb and 7 months. Goodnight Arrow! This pup hoodie doubles as pup PJs. Louie keeping warm in the snow with his new Hoodie from BaxterBoo. Fits him great nice and thick! Bo just loves his hoodie and socks from BaxterBoo! Priscilla is a 6 mo old Bugg, weighs 16 lbs, and wears the medium perfectly. Love these hoodies! Posted On 10/28/18 by Stephanie M from , NY Yes, Stephanie M recommends this product! Got this for my puggle puppy, as I’ve had trouble finding things that fit her in stores. This fits perfect and she loves it! Definitely will get her a few more in other colors. Posted On 01/28/18 by WENDY S from Navarre, FL Yes, WENDY S recommends this product! SOOOO soft and stylish on my sweet Yorkie! Perfect fit! Now she needs one in every color, ha! Posted On 01/11/18 by Renae from Waterloo, IA Yes, Renae recommends this product! Just received this basic black hoodie and I love it! I got a medium for my 14# jack russell terrier and it fits perfect. She looks so cute in it and is nice and toasty. Thanks BaxterBoo! Posted On 12/13/17 by Nancy C from Brooklyn, NY Yes, Nancy C recommends this product! What dog doesn't need a black hoodie !? Nice fitting and high cut underneath, so DeVito doesn't pee on it ..... that's important ! I like the little white snap at the neck .... it adds a little more style ! I ordered DeVito a size L and it fits well . His measurements are as follows : neck -15" , chest - 22" , back length - 19" . This is a great hoodie. Zuzu wears a size small and she is 3lbs. There is extra material which I like to allow for shrinking. We call this her Mr Robot hoodie. Got the size small and it fits my 3 pound teacup poodle very well with some room to spare which I prefer. It’s cozy and basic and I love to add decorative accessories to it. Love these hoodies. Always a great price. 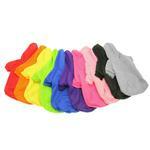 They are simply designed and great for cool fall weather walks. Posted On 11/12/17 by Deni S from New York, NY Yes, Deni S recommends this product! The small fits my 3lb poodle very well Very basic and cozy and easy to put on. Barking Basics for ALL Breeds! All breeds are NOT created equal, and this is why I LOVE these hoodies! I orders one in every size to customize them for friends and the XS is a little bigger than the palm of the hand while the XXXL could easily fit on a St. Bernard! I love than my large dogs (Sizes XL & XXL) looks just as adorable as a small pup would in them! The hoodie pocket is a cute touch, and I love that there is a slit to fit the loop of a collar so you can take your dogs for a walk while they wear it. All around GREAT product, and I definitely plan on buying more! Posted On 11/03/17 by Patricia C from pakdale, CA Yes, Patricia C recommends this product! Posted On 10/23/17 by Deni S from NY, NY Yes, Deni S recommends this product! This is a soft and cozy sweatshirt!! Posted On 10/04/17 by DoxieMomof3 from Greeneville, TN Yes, DoxieMomof3 recommends this product! I actually couldn't be happier with the fit and feel of this hoodie. I ordered a size medium for my 15lb dachshund and it actually fits him length wise--which is a huge deal!! I really like the hole for a leash and even the cute little button on the front. I will definitely be buying more colors! Posted On 03/15/17 by Michelle Porstner from Woodstock, IL Yes, Michelle Porstner recommends this product! Only complaint is that it did not fit my dog and had to return it along with the second one ordered. Posted On 03/11/17 by Laura M from Cinti, OH Yes, Laura M recommends this product! This unfortunately did not fit my dog and had to be returned. Good quality hoodie, was disappointed it was too large for my dog. Posted On 02/03/17 by Bobbijo from , CA Yes, Bobbijo recommends this product! Posted On 01/21/17 by Michaelle K from Battle Ground, WA Yes, Michaelle K recommends this product! I've ordered hoodies before. I ordered a medium for my pug in blue. Fit great! This black one I ordered in medium, and it is WAY smaller!! Not the same size at all! Posted On 01/21/17 by Irene L from , MI Yes, Irene L recommends this product! Soft and the right length. The hood even fits right. It's a little long for my big-chested pitbull, but still works great! This is a nice hoodie for my pet. Posted On 01/17/17 by Lindsay N from Lee Center, NY Yes, Lindsay N recommends this product! Posted On 01/15/17 by Melissa M from Las Vegas, NV Yes, Melissa M recommends this product! Posted On 01/14/17 by Carolyn R from NYC, Yes, Carolyn R recommends this product! Super cute and simple. A good not bulky layer to add under my lil guys parka (on those super cold days) Stock up when they are on sale! Posted On 01/11/17 by Jamie A from Shorewood, IL Yes, Jamie A recommends this product! I love the hoodies! They fit my "hard to fit" bulldog's body shape perfectly! My yorkie looks so cute with her new hoodie! Now I want to get her more in each color! Posted On 01/04/17 by cheryl g from sutherlin, OR Yes, cheryl g recommends this product! I love these Hoodies....my Sissy does too. I almost have all the colors. These keep her warm and looking stylish. Posted On 01/04/17 by Elizabeth D from , IA Yes, Elizabeth D recommends this product! They fit very well, and are well constructed. I was able to do custom heat transfers to put their names on them and it worked great! Posted On 12/29/16 by Chrissy from Amsterdam, Yes, Chrissy recommends this product! I purchased this hoodie for my staffy. I used the size guide for this item but is was at least 2 sizes to big. Staffies are hard to buy for but this one was extra long in length. The hoodie itself is nice but runs big. This well made, comfortable, warm hoodie is a hit in deep black! It certainly keeps the pooch warm when it's cold outside! You Can't Go Wrong With Black! Great quality! Love these hoodies! Posted On 12/17/16 by Amanda W from Summerville, SC Yes, Amanda W recommends this product! Great shirt! I love it!! Posted On 12/15/16 by Kara H from Waxahachie, TX Yes, Kara H recommends this product! Black hoodies, I Love them! Posted On 12/15/16 by Yuni from , NY Yes, Yuni recommends this product! Upon receiving it there was noticeable white pet hair on the sweater already.Other than the unexpected hair it fit my pup pretty nicely and it's well made. Nice Hoodie for the winter! Posted On 12/15/16 by Kyle from Hilliard, OH Yes, Kyle recommends this product! Fits perfectly on my medium-sized (35 lb) dog. Easy to slip on and off. Keeps my dog warm at night! Only downfall of these hooded sweatshirts is that I have to take them off my boy dogs, otherwise they pee inside it, but I put it right back on when they come back inside. Since it's so easy to put on and take off, it's not a deal breaker. Posted On 12/14/16 by Lacy P from , KS Yes, Lacy P recommends this product! This is a great sweater, my dog really likes it. She usually does not like having clothes on, but she doesn't mind this hoodie! Posted On 12/10/16 by Lauren C from Des Plaines, IL Yes, Lauren C recommends this product! I have two dogs. They both - I said both - do not allow me to remove them they like them so much! They fit perfectly and they both look so handsome and they know it, too! Best purchase I've made that fits so well! My dog looks super cute in this. It's high quality and consistent sizing. Not super thick but keeps him warm. Posted On 11/10/16 by Jennifer C from Pittsburgh, PA Yes, Jennifer C recommends this product! Nice and warm with leash hole. It is easy to put a harness under the hoodie or over it. Posted On 11/10/16 by Carolyn C from Alabaster, AL Yes, Carolyn C recommends this product! Posted On 10/29/16 by Richard L from Chicago, IL Yes, Richard L recommends this product! Our pup hates the cold. Even the slightest chill gets her nervous, so we've tried lots of light and heavy jackets and coats but none have fit her very well or have left her exposed in vital places. This hoodie fits perfectly, not too snug but not baggy, and covers her whole back and belly. Plus it's a black hoodie so she looks cool. Posted On 10/12/16 by Michelle R from Dallas, NC Yes, Michelle R recommends this product! My babies love their hoodies. I have to buy several for each one so they're will have a hoodie on while another is being washed. They wear hoodies all winter long and love them. Everyone needs that little black dress. My boys need their little black hoodie. Posted On 10/09/16 by Cyja G from Armuchee, GA Yes, Cyja G recommends this product! Jack, my dachshund, loves it. He is very cold natured, and it has been difficult to find sweat shirts to fit him, it was a perfect fit, and we have already used it on a camping trip, and he was very warm. Thank you, and I have recommended your site to my friend. Posted On 10/02/16 by Mickey from Hartford, CT Yes, Mickey recommends this product! Warm, soft, and keeps me clean! Posted On 09/30/16 by Amber H from Franklin, TN Yes, Amber H recommends this product! It's a little snug in the chest but everywhere else fits perfectly, especially around his waist. The underside is cut just high enough to allow for worry free potty breaks, yet still far enough down to keep him warm. Best fitting hoodie I've found for his precious (but almost impossible to fit) pug build. Posted On 09/27/16 by Peggy C from Scottsville, NY Yes, Peggy C recommends this product! Really good quality, however the medium was too small and the large is a tad too big. Posted On 09/19/16 by CHERYL F from New Orleans, LA Yes, CHERYL F recommends this product! I love it! Perfect for the "in-between" weather we have. Maui is absolutely adorable in it!! This is Annie's third Barking Basics Hoodie from Baxterboo. This time we purchased the black and Annie being just under 9lbs, we found the "Medium" fits her well, roomy enough for comfort and her harness underneath for going on walks!!! These hoodies are a good value, made well, nice weight and comfy soft!! Thank you Baxterboo !!! This hoodie has lasted through rough play, laundry and it is warm and so cute. I personalized the black one with a Batman Logo and mask on the hoodie! This hoodie is super cute on my pup! It fits him well in the cold winter months! Posted On 03/22/16 by Elizabeth T from , ID Yes, Elizabeth T recommends this product! I really like this hoodie...the material is soft and easily cleaned. My only complaint is that it's not cut high enough on the underside and unless I pin it, my dog (male), pees on it! Going to try a Sport Hoodie next, but this one is good for layering since it runs a little big. Posted On 03/03/16 by Carol L from Columbus , OH Yes, Carol L recommends this product! Black hides mud when playing. Charley needs to maintain his top-dog image and this basic black hoodie helps convey that he is both an athletic player and a good dresser. He enjoys romping around in his new attire on a crisp spring-like day. Posted On 02/07/16 by Shannon P from Boulder, CO Yes, Shannon P recommends this product! I bought this for my yorkipoo and it keeps him warm and looks great. Posted On 01/28/16 by Alicia R from , Yes, Alicia R recommends this product! Love it have 3 others. Mojo looks awesome, slightly snug, but still comfortable. Totally as expected, great product! Posted On 01/04/16 by Jeff D from Depew, NY Yes, Jeff D recommends this product! The hoodie is awesome I have a 7 month old bullmastiff and bought a XXL in black and it fits perfect and he loves it. So because of the awesome sale I bought a XXXL for the future as he is still getting bigger. This is a wonderful thick warm hoodie that fits the big boys and girls. I have two of them! fits nice. right size. looks good. I would buy this again. Posted On 12/23/15 by Cat S from Elk Grove, CA Yes, Cat S recommends this product! I measured dogs according to instructions. The little dogs (chihuahuas) hoodies fit fine. I ordered a XL for my big kid (G Shep X) but it was too tight. He was able to wear it but it didn't fit quite right. I then ordered an XXL. When I received it fit him fine but perhaps could have gone to XXXL. I noticed the instructions on tag seemed different than what was online and had I read that would have probably ordered XXXL. That being said it is a good quality sweat shirt material and not much shrinkage after washed. I would still recommend. Posted On 12/20/15 by Tara N from Wilmington , NC Yes, Tara N recommends this product! I love the basic hoodies! My dogs have outgrown their XL so I ordered the XXL this time which fit great in the neck/chest area but is way too long. My fault for not measuring, but I didn't expect the next size up to be so much longer. Posted On 12/17/15 by Lindsay P from Brook Park, OH Yes, Lindsay P recommends this product! It is (supposed to be) getting cold here in Ohio (2 months ago) and I wanted my dog to be warm outside as he has very little fat or hair on him. He loves this hoodie - and it's the first time any clothes have ever been put on him. The hoodie is very soft and you can't beat the price or color options! This hoodie is amazing!!! It fits both my dogs perfectly. My dogs seem to be very comfortable and love wearing their hoodies!!! Posted On 12/07/15 by Jacqueline from , CT Yes, Jacqueline recommends this product! I got this hoodie in Orange and black and my 90 lb dog loves them!! He also happens to look adorable and cozy in them and is so much warmer!! He loves when I put it on him!! Thank you Baxterboo!! For my Poms and Terriers -- so cute on them! Wiener in the hoodie said yes! well made and high quality! Bought for the wiener. he's an older fellow and has no problem with it. he wears it regularly! I find the products I've purchased to be of great quality and very cute. I will continue to look at Baxter Boo first for harnesses for my fur baby. We always get compliments.